Our pets always seem to get into the act. Whether it's conducting their own Super Bowl [this year marks the 'Puppy Bowl's' 10th year] or it's the birth of the newest Clydesdale foal, our furry and aquatic friends are always there to remind us they liked to be included in the Big Game's annual festivities. 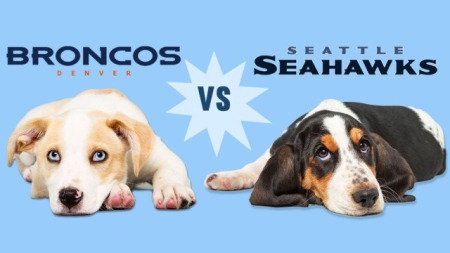 This year, pets and their masters have come up with several innovative selection methods as to whether the Seattle Seahawks or the Denver Broncos are going to win Super Bowl XLVIII. 1- Anastasia: On January 24th "Tonight Show with Jay Leno," the talk show host and former quarterback Terry Bradshaw came up with a novel method of deciding the Super Bowl winner when the show welcomed back a Jack Russell Terrior named "Anastasia" after picking winners for the last 3 Super Bowls in a row. With the team colors of blue for Seattle and orange for Denver, the dog's task was to pop all the balloons on the stage - whereby the last balloon standing would be declared the winner. Teddy Bear is actually a porcupine. He's predicted the winners of Super Bowl 46 and Super Bowl 47, but will his prognosticating skills hold up for this year's Big Game? As you can see, his challenge was based on which helmet held the most enticing corn on the cob? What does football and pigs have in common? Well, for one the original football was said to be made out of pigskin - or an inflated pig's bladder. While that's no longer the case, the pot-bellied pig known as Pancakes who resides at the Fort Worth Zoo was put to the test when he had to choose between two footballs, filled with his favorite foods; Cheerios, grapes and zucchini. An unidentified canine breed named Sugar when asked by his master who was going to win the Super Bowl whispered in his ear his odds-on favorite. Two additional unidentified breeds, Peanut and Jersey were enticed by what looks like a strip of bacon. Two manatees names Hugh and Buffet who live at the Aquarium at the Mote Marine Laboratory in Sarasota, Florida didn't seem to agree on the winner this year. When aquarium officials posted two targets featuring each team's logo, Hugh chose the Seahawks, while Buffet pick the Broncos. The Manatees Prediction: While the law of odds says Hugh and Buffett each have a 50/50 chance of being right, the Marine lab researcher Kat Nicolaisen is putting more stock in Buffett's pro-Broncos prediction - since Buffett has predicted the winning Super Bowl team correctly for the last six years, while his half-brother Hugh is only 4 out of 6. Well, while it's not conclusive -- and we wouldn't advise you to run off to your book-maker just yet -- it does appear that a good number of our favorite pets are favoring the Seahawks over the Broncos to take home the Vince Lombardi Trophy this year. Has your pet weighed in yet? Comment below and let us know what your pet has to say about this year's Super Bowl Champs! (and posting LINKS to other videos are always welcome). See you on the 50-yard line!